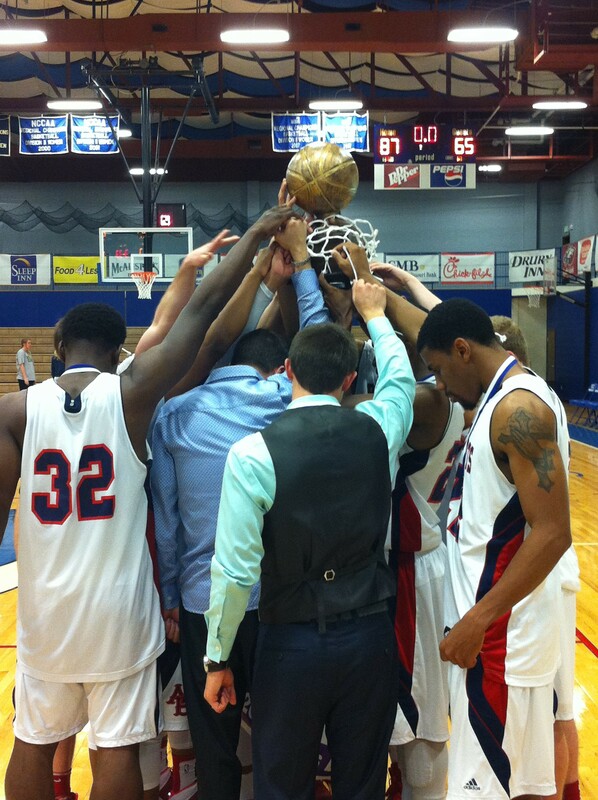 The Arlington Baptist Patriots Men’s Basketball team made history this weekend as they became the first team in the College’s existence to claimed an ACCA National Championship. 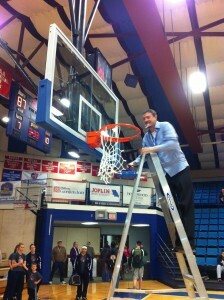 Tournament action began Thursday night at Missouri Southern State University’s campus against Baptist Bible. The number one seeded Patriots rolled to an easy victory against the Baptist Bible men while senior Postman Jeremiah Ford put up 20 points with 4 rebounds and 2 assists. Additional sparks came from the bench as Sophomore Guard Jonny Shrake grabbed his first double-double of the season with 16 points and 10 boards. Phillip Nwakama, a Sophomore Postman, stepped up in a crucial time for the Patriots as their starting center went down with an ankle injury just prior to the tournament; going 6-8 from the field and gathering 9 rebounds to help the Patriots cruise to a 108-68 victory. Friday night, March 14, the Patriots faced off against Multnomah University, a sharp shooting team from Oregon that averages well over 100 points per game. Last year in the ACCA tournament the Patriots were kicked out of the winner’s bracket by MU after giving up a 30 point lead at the half. Fortunately, history would not repeat itself as the Patriots refused to get flustered by Multnomah’s attempts to speed up the tempo of the game, and forced them to play defense in the half court. The Patriots became one of just a handful of teams to keep MU under 100 points this season as they brought home the win 95-84. The Patriots were led in scoring again by Jeremiah Ford and Joshua Green, who each had 22 points on the evening, while sharp shooter Raphael Garcia added 20 points himself by knocking down six three’s. Again a much needed spark off the bench came from Sophomore Postman Phillip Nwakama as he grabbed his first double-double of the year, dropping in 15 points and 10 boards. Additionally, Point Guard Simeon Brinkley had 3 points and dished out 9 assists, leading the team for nearly the whole 40 minutes yet again this year. Saturday, March 8 the Arlington Baptist Patriots faced off against the Rhema Bible Eagles in their third meeting of the year where previously the two teams had split, each taking a win on their home court. The Patriots were not shooting well in the first half against the Eagles, although the shots were not falling on either end as both teams went a combined 1-18 from behind the arc. The inside presence however is what turned the ballgame in the Patriot’s favor as Senior Postman Jeremiah Ford went to work, scoring 15 points and grabbing 5 offensive boards in just the first 20 minutes of play! Ford finished the night with a second straight double-double, tallying 26 points 13 boards, and 3 steals. Entering the half the Patriots were up 14 points (40-26) and would continue to put distance on the Eagles as the remaining 20 minutes of the clock ticked down. Helping considerably in this endeavor was Junior Shooting Guard Raphael Garcia who hit 5 out of 7 three’s in the second half, effectively frustrating the Eagle’s attempt to press the Patriots in order to get back into the game. 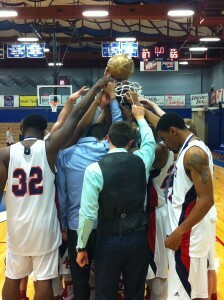 Garcia finished the night with 18 points, 5 boards, and 3 steals as the Patriots won the game 85-67. Jeremiah Ford was elected as the ACCA National Tournament MVP as in three games he averaged 22.6 points per game and 9.1 boards a game; putting up two double-double’s. Garcia averaged 18.6 PPG during the Tournament and shot over 46.6% from behind the arc, connecting 18 out of 40 three point attempts. 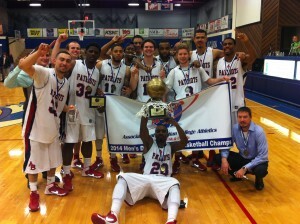 Senior Point Guard Simeon Brinkley averaged over 6.3 assists per game during the tournament while Junior Josh Green scored 15.3PPG in the Patriots first ACCA National Championship ever. The Patriots continue tournament action as they travel to Circleville, Ohio where they will participate in the NCCAA National Tournament beginning on Thursday March 13th.